I had the lovely fortune to be seated next to Kevin Scott at the Inside Story, sponsored by SCBWI Western Washington, hosted by The Neverending Bookshop, at the Bellevue (WA) Public Library this past spring (if you are a local teacher, librarian or bookseller, you need to attend this event!). I was so touched by Kevin’s “story behind the story,” I invited him to be a Friend Friday on the spot. You’ll see below why his “story behind the story” was so compelling that evening, and you’ll see why you need to read Frederik Sandwich and the Earthquake that Couldn’t Possibly Be (Sourcebooks Jabberwocky) after you read Kevin’s post below. I’m thrilled to be invited to introduce my books in such esteemed company. Thank you, Kirby! My middle-grade Frederik Sandwich series is about a boy who cannot pronounce his own name, and his only friend, the weirdest girl in town. In Frederik Sandwich and the Earthquake that Couldn’t Possibly Be (Sourcebooks Jabberwocky, 2018) , the friends unearth a plot to murder the much-loved mayor of their borough. But when they try to raise the alarm, no one will listen. Why? Because he can’t pronounce his own name and she’s the weirdest girl in town. But why can’t he pronounce his name? It happens that Frederik’s parents, moments before his birth, recklessly emigrated to a gnarly nobble on top of another continent entirely. Frederik grows up in a land where his name is not pronounced as you or I might say it, but something more like Fg-ll-el-el-ek. Like many an immigrant child, Frederik just wants to belong. He is a conscientious rule-follower, and the borough has lots of rules. The mayor insists upon them. Frederik’s friend Pernille meanwhile, is a total rule-ignorer. Their conflicting philosophies unlock secrets kept from the community for decades, and the shocking truth behind an earthquake that couldn’t possibly have been. In book #2, Frederik Sandwich and the Mayor Who Lost Her Marbles (Sourcebooks Jabberwocky), Frederik and Pernille trigger social-media mass-hysteria, by accident. There isn’t really a zombie threat to the borough – that was a joke – a story they made up. But the all-powerful mayor sees it differently. The panic might derail her showpiece Midsummer Festival. Pernille is arrested and taken away, leaving Frederik the rule-follower with only one recourse. To save his friend he will have to break every single rule in the borough simultaneously. I started writing these stories one Halloween, at 4pm. I know this because it was the day my son was born. My wife and I had recently, recklessly moved from the Pacific Northwest to the ancient kingdom of Denmark. How hard could it be to have our first child in a new country where we didn’t speak the language, after all? They surely had babies there too? At 4pm that Halloween, I found myself in a crumbling 19th century hospital. It was already dark. Rain was lashing the windows. My son, hours old, was asleep in a plastic tub. My wife was sleeping too, exhausted and drugged from childbirth. But I was wide awake. Because it had suddenly dawned on me I was in a foreign country, where I couldn’t speak the language, with a new-born baby. And I had no idea what any of the rules were. My son, I realized, would grow up at a massive disadvantage. Unable to pronounce the impenetrable language, oblivious to basic expectations. In my panic, I grabbed a hospital pen and a sheet of hospital paper and started writing a list of the many ways I had failed my child and the trials he would face in future. That list became Frederik Sandwich and the Earthquake that Couldn’t Possibly Be. The cover says the book is for ages 8 to 12, but I think of it as 8 to 112. It’s more inclusive. And as Pernille would say, rules are for fools! 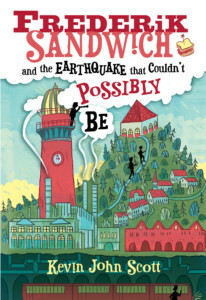 Kevin John Scott is the author of Frederik Sandwich and the Earthquake that Couldn’t Possibly Be (Sourcebooks Jabberwocky, 2018). 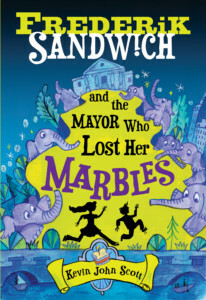 The sequel, Frederik Sandwich and the Mayor Who Lost Her Marbles will be released in February 2019. Kevin was born in the oldest town in Britain and has lived in a jumble of peculiar countries. Today he lives near Seattle with his wife and son. 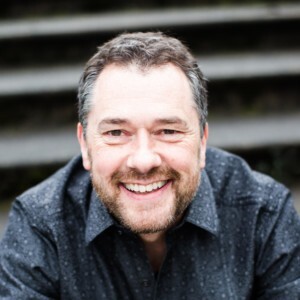 You can find Kevin on his website (www.kevinjohnscott.com) and on Facebook (www.facebook.com/authorkevinjohnscott), Instagram (_kevinjohnscott), and Twitter (@_kevinjohnscott).